We received the following report in April 2009. Is this ghostly ship still sailing the lake? "Growing up I didn't particularly believe in ghosts of any kind, but that all changed back in the summer of 1998! Sometime in July/August (Of 98) a family friend, my brother and I, went swimming at a beach just outside of Cobourg on lake Ontario. It was a extremely calm clear day and you could see for miles. Starting in the late morning, I noticed a large sailing vessel under full sail, cruising past the beach (I reckon it was travelling at about 6-10 Knots. At the time it seemed odd to me that it was travelling this fast on such a calm day!). This caught my interest, since I am an avid sailor and nautical buff. 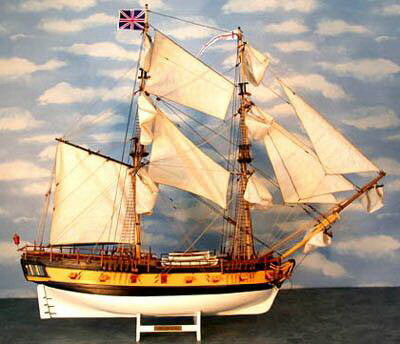 It appeared to be a "square rigged" merchantman like vessel of the type commonly seen in the 1700s. At the time, it occurred to my, that it was probably a modern reproduction on it's way to a regatta or similar event. I watched it for about 10 minutes, and went back to swimming. A few minutes later I looked out to see that the ship had apparently reversed it's course and was now heading in the opposite direction (This also seemed odd, considering that it would not be possible to pull such a tight manoeuvre, in such a large vessel in so little time!). Every once in awhile, I would look out at the ship, watch it for a while, swim for a few minutes, look out again, only to discover that it had reversed it's course and was heading in the opposite direction! This continued to happen over the course of the afternoon. It was as if, it was sailing back and forth over the same spot, looking for something. I never did see it turn, it was just sailing in the opposite direction from the previous time that I had looked (I never had my eyes off of it for more than 10 minutes). Several hours after I first sighted it, I looked up and it was nowhere in sight, it had just vanished into thin air! I could still see for miles, and there was no plausible explanation, as to where it had gone, it had just disappeared! I stopped by the Harbour Master's office afterwards, and asked him about it. He checked his log books and claimed that no such vessel was currently registered as sailing the great lakes! It was at this point that I put 2 & 2 together and realized that I had actually seen a "Ghost Ship"! I have often thought about this experience and wondered what ship I had seen. Until tonight, I hadn't bothered to find out more about this mysterious vessel. I did some digging and, near as I can tell, the only ship of this type, that ever sailed Lake Ontario or the Great Lakes, was the"HMS Ontario", which sailed into a storm and sank with all hands on October 31, 1780! I checked out some pictures of different models of the HMS Ontario, and have concluded that it was this ship that I saw! I will never forget that day or the mysterious vessel, who's image will remain burned in my memory until the day I die! When I close me eyes I can still see it's every detail!" Further witness comments: "Upon seeing this, I am now quite certain that this was the ship that I saw! The reason that I'm so sure, is that it is both a "square rigger" and it's hull is painted white(Not a very common colour for a hull! )up to the waterline. The rest of the colouring also matches what I saw! Also, I do believe that I saw the Union Jack flying from her mast!"